Astrodynamics is the study of a satellite's trajectory or orbit, that is, its path through space. The satellite's ephemeris is a table listing its position as a function of time. The first section below explains the terms used to describe satellite orbits, provides equations necessary to calculate orbital elements from position and velocity, and shows how to predict the future position and velocity of a satellite. We base this method on a simple, but accurate, model treating the Earth and the satellite as spherical masses. The next section discusses how forces other than the Newtonian gravitational force affect the orbit of a satellite. The third section explains maneuvering strategies used to change the satellite's orbit The final two sections discuss the available launch times and methods for maintaining satellite orbits. Several textbooks are available in the areas of satellite orbits and celestial mechanics. Some of the most popular are Bate, Mueller, and White , Battin , Danby , Escobal , Kaplan , and Roy . More recently Chobotov , Wiesel , and Vallado  have provided works specifically on spacecraft astrodynamics. Explaining the motion of celestial bodies, especially the planets, has challenged observers for many centuries. 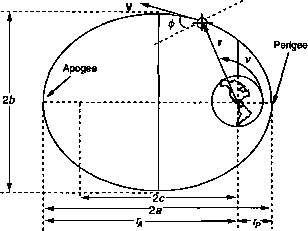 The early Greeks attempted to describe the motion of celestial bodies about the Earth in terms of circular motion. 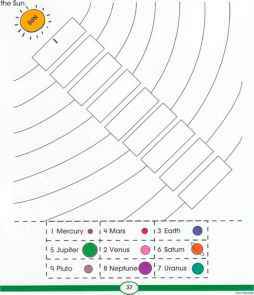 In 1543, Nicolaus Copernicus proposed a heliocentric (Sun-centered) system with the planets following circular orbits. Finally, with the help of Tycho Brahe's observational data, Johannes Kepler described elliptical planetary orbits about the Sun. Later, Isaac Newton provided a mathematical solution for this system based on an inverse-square gravitational force. • First Law: The orbit of each planet is an ellipse, with the Sun at one focus. • Second Law: The line joining the planet to the Sun sweeps out equal areas in equal times. • Third Law: The square of the period of a planet is proportional to the cube of its mean distance from the Sun. Figure 6-1 depicts the key parameters of an elliptical orbit. The eccentricity, e, of the ellipse (not shown in the figure) is equal to da and is a measure of the deviation of the ellipse from a circle. Isaac Newton explained mathematically why the planets (and satellites) follow elliptical orbits. Newton's Second Law of Motion, applied to a constant mass system and, combined with his Law of Universal Gravitation, provides the mathematical basis for analyzing satellite orbits. Newton's law of gravitation states that any two bodies attract each other with a force proportional to the product of their masses and inversely proportional to the square of the distance between them. The equation for the magnitude of the force caused by gravity is where F is the magnitude of the force caused by gravity, G is the universal constant of gravitation, M is the mass of the Earth, m is the mass of the satellite, r is the distance from the center of the Earth to the satellite, and p = GM is the Earth's gravitational constant (= 398,600.5 kitfs"2). This equation, called the two-body equation of motion, is the relative equation of motion of a satellite position vector as the satellite orbits the Earth. In deriving it, we assumed that gravity is the only force, the Earth is spherically symmetric, the Earth's mass is much greater than the satellite's mass, and the Earth and the satellite are the only two bodies in the system. Fig. 6-1. Geometry of an Ellipse and Orbital Parameters. where a is the semimajor axis, e is the eccentricity, and v is the polar angle or true anomaly. A conic section is a curve formed by the intersection of a plane passing through a right circular cone. As Fig. 6-2 shows, the angular orientation of the plane relative to the cone determines whether the conic section is a circle, ellipse, parabola, or hyperbola. We can define all conic sections in terms of the eccentricity, e, in Eq. (6-3) above. The type of conic section is also related to the semimajor axis, a, and the specific mechanical energy, E. Table 6-1 shows the relationships between energy, eccentricity, and semimajor axis and the type of conic section. Fig. 6-2. Geometric Origin of Conic Sections. 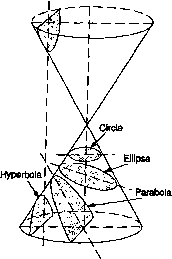 Satellite orbits can be any of four conic sections: a circle, an ellipse, a parabola, or a hyperbola. TABLE 6-1. Conic Sections. See text tor discussion.